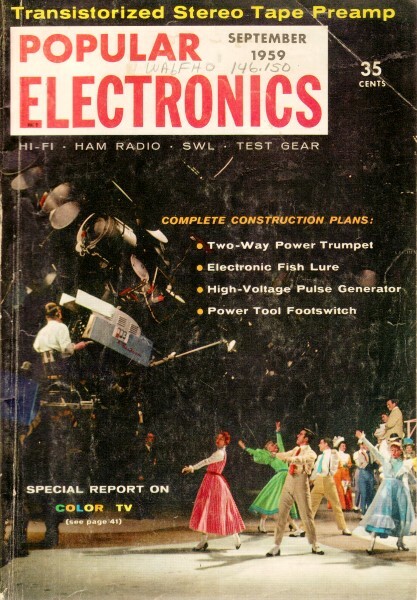 Transistors were still relatively new when these cartoons were published in 1959. Most people had never seen a transistor, much less handled one. Courtesy of General Transistor Corp.
We've all heard how sturdy and indestructible the transistor is ... but nothing is perfect. Any qualified engineer, equipped with the proper educational background can, with a little ingenuity, reduce the transistor to a midget jellyfish. 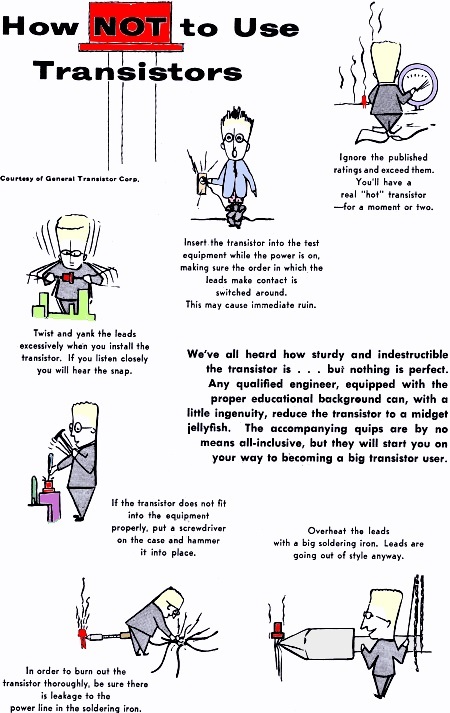 The accompanying quips are by no means all-inclusive, but they will start you on your way to becoming a big transistor user. Ignore the published ratings and exceed them. You'll have a real "hot" transistor - for a moment or two. make contact is switched around. This may cause immediate ruin. Twist and yank the leads excessively when you install the transistor. If you listen closely you will hear the snap. If the transistor does not fit into the equipment properly, put a screwdriver on the case and hammer it into place. Overheat the leads with a big soldering iron. Leads are going out of style anyway. In order to burn out the transistor thoroughly, be sure there is leakage to the power line in the soldering iron.